With steps on both ends, the series C-DWP is commonly used to work alongside large machinery to enable descent or ascent from both sides of the ladder. Climbing angle is 59 degrees. The ladder is powder coated with high gloss powder. Pick your color from our 11 stock choices. The steps are 7" deep, with platform sizes ranging from 48" to 84". Grip Strut tread is standard. The load rating is 600lbs. Ladders ship set-up with handrails shipped disassembled to prevent damage. Determine the platfrom length (48", 60", 72" or 84"). Scroll down the list until you find the right length. What platform height do you need (30", 40", 50", 60" or 70")? Do you want 24"W or 36"W steps and platform. Detemine color: Grey power coat is the standard finish. Beige, dark brown, yellow, black, green, blue, red, white, orange and light grey are optional - Add to the notes section of the order. Steps and top platform are fabricated from heavy duty non-slip Grip Strut (Pic. 2) supported by a rugged 1" O.D. tubular frame. All units have 36" high handrails which are shipped knocked down for field assembly in minutes. 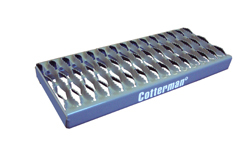 Exclusive heavy duty Cotterman Safe-Lock is provided at both ends for mobility. 2.5" diameter, 1" thick rubber pads on four legs hold the platform secure during use. Four manufacturing locations to serve you and reduce shippping costs California, Michigan, Texas and Georgia. Ladders ship set-up with handrails shipped disassembled to prevent damage. ZORIN will provide you with a freight quote via email prior to processing the order.